Finally, Samsung Galaxy S4 KitKat update is available for more and more carriers. Now, let’s explore the top 12 new features and improvements in this Galaxy S4 KitKat update (4.4.2). Because the system update need approval from individual carriers, you may wait a bit longer time than the others depending on the carrier, model, and region. The Galaxy S4 KitKat update is more or less incremental in the user interface. 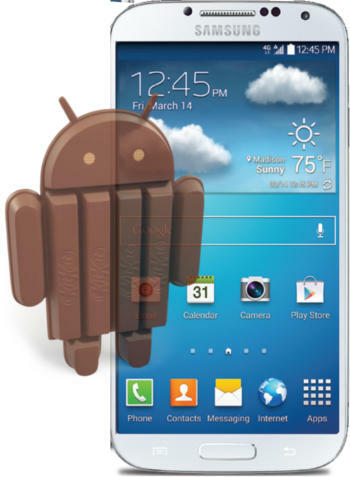 Most users will just feel slightly new interface after getting this Galaxy S4 KitKat update. This Galaxy S4 KitKat (4.4.2) update is far better than the S4 Jelly Bean 4.3 update, which is probably the worst Android update. As detailed in this post , there were so many problems in the S4 Jelly Bean 4.3 update. So far, after trying the Galaxy S4 KitKat update, I’m quite happy with it. The Samsung Galaxy S4 KitKat update brings the full-screen music player control to the lock screen. You can control your music player in the lock screen without unlocking the your Galaxy S4. The good news is full screen music player on lock screen works for most music players, not just the stock Samsung music player or just Google Play music. Amazon MP3 player works as well. After getting the Galaxy S4 KitKat update, you will find the camera app shortcut in the lock screen. Essentially, you can snap pictures quicker. This is a small, but very useful feature. In Android KitKat 4.4, Google makes it easier to change launchers (of course, your home screen). Samsung did not crop this feature in this Galaxy S4 KitKat update.